Does your family enjoy Quaker Instant Grits? 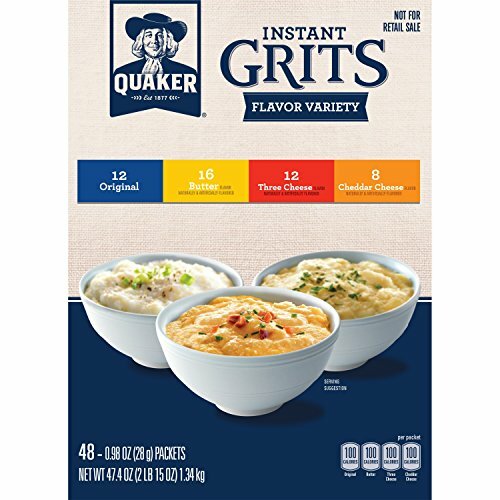 Hurry and get the Quaker Instant Grits Variety Pack, 0.98 oz, 48 Count today for as low as $7.64 from Amazon when you choose subscribe & save with at least 5 subscription! That’s less than 16¢ per breakfast!! Check out all of the recent Amazon deals here! If you prefer one-time purchase & pay $8.99. Get FREE shipping (2-day for Amazon Prime members) when you purchase $25 or more of eligible items across any product category. Check out the Quaker Instant Grits details below. Variety pack includes (12) packets of Original grits, (16) packets of Butter flavored grits, (12) packets of Three Cheese flavored grits, and (8) packets of Cheddar Cheese flavored grits. If you love grits in all their glory, Quaker delivers Original, Butter,Three Cheese and Cheddar Cheese flavors. Get ’em while they’re hot. Pick your passion for breakfast or any meal of the day. Go for it. You’re a minute away from instant grits gratification. These individual packets of Quaker Instant Grits are quick and easy to prepare. Simply empty the packet contents, add hot water, and stir. You can have a warm and hearty serving of creamy grits in just minutes. Buy the Quaker Instant Grits Variety Pack, 0.98 oz, 48 Count from Amazon.